One of the great achievements of the EU was to assist, encourage, and in some cases induce the states of central and eastern Europe that, prior to 1989-91, were controlled by Communist parties to create democratic polities governed by the rule of law. At Copenhagen in June 1992, the European Council, the heads of state or government of the EU, elaborated the criteria that had to be satisfied for membership in the EU; one of them was the existence of stable institutions guaranteeing democracy, the rule of law, human rights and respect for and protection of minorities. Whether because of the desires of the transitional elites to create a democratic polity or the explicitly conditional nature of membership in the EU, by the time eight of the countries formerly controlled by Communist parties entered in 2004, six of them—the Czech Republic, Estonia, Hungary, Poland, Slovakia, and Slovenia—had achieved the highest possible score on the Freedom House annual seven-point measures of political rights and civil liberties. Latvia was one notch lower on one of the measures and Lithuania and the 2007 entrants—Bulgaria and Romania—were one notch lower on both. Since they became members, several of those countries—the Czech Republic, Estonia, Slovakia, Slovenia, and Lithuania since 2005—have continued to receive the highest possible Freedom House scores for political rights and civil liberties. But there have been some footdraggers and backsliders. Bulgaria and Romania are where they were, in terms of the Freedom House measures, when they entered more than a decade ago. And Latvia, Poland and, in particular, Hungary have experienced substantial democratic backsliding in recent years—Latvia in regard to political rights, Poland in regard to civil liberties, and Hungary in regard to both. Article 7 of the treaty elaborates a multi-stage process that can be triggered by a “reasoned proposal” by one-third of the member states, the European Parliament, or the Commission that can result in the suspension of certain rights deriving from membership, including the voting rights of the government’s representative in the Council. It requires, first, that four-fifths of the members of the Council determine there is a “clear risk of a serious breach” of the values referred to in Article 2; then, that the European Council, acting by unanimity, determines there is a “serious and persistent breach” of those values; and finally, that the Council, acting by qualified majority (i.e., a super-majority), then suspends those rights. 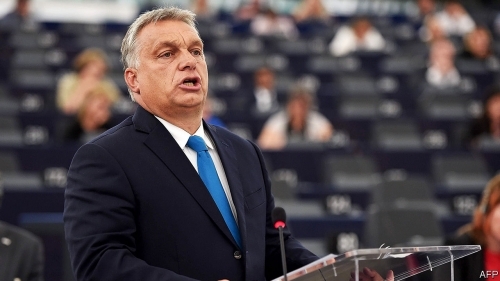 Last Wednesday, the European Parliament voted by an overwhelming margin—448 to 197, with 48 abstentions—that there is a “clear risk of a serious breach” of the values described in Article 2 by the Hungarian government headed by Viktor Orbán. The vote came after Judith Sargentini, a Dutch MEP, presented a report, commissioned by the parliament, that concluded there was a “clear breach of the values of our union,” including a “systematic threat to democracy, the rule of law and fundamental rights” and recommended initiating Article 7 proceedings. Among the problem areas noted in her report were efforts to limit the independence of the judiciary, curtail academic freedom and freedom of expression, manipulate the electoral system in ways that benefit the governing party and hurt the opposition, and deprive refugees and minorities of rights. As important as the vote was, there is virtually no chance Hungary will be subjected to a suspension of the rights it enjoys as a member state, including its voting rights in the Council. The parliament having established the existence of a “clear risk of a serious breach” in a vote that exceeded the two-thirds majority needed to initiate an Article 7 proceeding, the matter now goes to the Council, which, before making any determination whether such a risk exists, must hear from the Hungarian government, address recommendations to it, and assess its response. Once that phase is completed, the Council will determine if there is in fact a “clear risk of a serious breach” of the values referred to in Article 2. If four-fifths of the Council (minus the Hungarian representative) conclude there is such a risk, the matter will then go to the European Council (minus Mr. Orbán) which will determine whether there is a “serious and persistent breach” of the values described in Article 2. If the European Council unanimously agrees, the matter will go back to the Council, which acting by a qualified majority, may decide to suspend certain of the rights deriving from Hungary’s membership, including the voting rights of Hungary’s representative in the Council. But, of course, the process won’t get that far—at least as long as Poland’s Law and Justice party (PiS), headed by Jarosław Kaczyński, Mr. Orbán’s good friend and fellow advocate of “illiberal democracy,” remains in office—for one obvious reason: the requirement of a unanimous vote in the European Council. Mr. Orbán can count on Mr. Kaczyński’s veto. After all, Mr. Kaczyński may in time need Mr. Orbán’s veto in the European Council; Poland is also the subject of an ongoing Article 7 process. Jarosław Kaczyński, leader of Poland’s Law and Justice Party. Last December, after repeated efforts for almost two years to engage the Polish government in a dialogue in regard to the rule of law, the Commission concluded there is a “clear risk of a serious breach” of the rule of law in Poland and proposed to the Council that it adopt a decision in that regard under Article 7. The Commission’s primary concern is more than a dozen laws that affect the entire structure of the judicial system and enable the executive and legislative branches of government to politically interfere in the composition, powers, administration and functioning of the judiciary. At the same time, the Commission also took the next step in the infringement procedure it had initiated in July 2017 and referred Poland to the European Court of Justice for a breach of EU law prohibiting discrimination on the basis of gender in regard to the mandatory retirement age for judges. In March, the European Parliament voted by a large majority—422 to 147—in favor of a non-binding resolution that supported the Commission’s decision to trigger Article 7 against Poland for undermining the independence of the judiciary and called upon the Council to swiftly determine whether there is a “clear risk of a serious breach” of the values referred to in Article 2. After Poland failed to address the Commission’s concerns in an initial hearing before the General Affairs Council in June, the Commission launched a second infringement procedure against Poland. Like the one pertaining to gender discrimination, this one is likely to result in a referral to the European Court of Justice and possible fines. More importantly, the Council will return to the Article 7 issue in the near future and it is quite possible it will conclude there is a “clear risk of a serious breach” in the rule of law in Poland. But if and when the Article 7 process against Poland reaches the European Council, it will undoubtedly be blocked by Mr. Orbán’s veto, just as the Article 7 process against Hungary will, if it reaches the European Council, be blocked by Mr. Kaczyński’s veto. The EU is, as Article 2 proclaims, a union of democratic states. But unfortunately, in portions of central and eastern Europe, it has become, and is likely to remain, a union of democratic footdraggers and backsliders. David R. Cameron is a professor of political science and director of the MacMillan Center’s Program in European Union Studies.